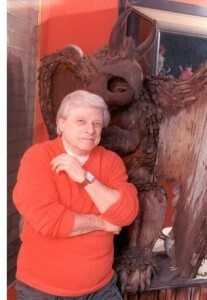 When Harlan Ellison learned he was ranked fourth in my list of Top Newsmakers of 2011 he gave me a call. I was away, so he gave Diana the number and promised “He’s not in trouble.” I don’t believe a science fiction writer has ever said that about me before. Readers of this blog will be amazed one has said it now. When I returned his call Harlan said he was pleased to have appeared in the list of Top 10 Newsmakers – and told me a great many more things I should have reported about him last year. Very true. And here they are. In 2011 Harlan was voted his fourth Nebula by the members of SFWA, for “How Interesting: A Tiny Man.” At the age of 77 he is the oldest person ever to win the award. He’s the only author with three Nebula-winning short stories. (Harlan won his other Nebula years ago for a novella, A Boy and His Dog.) He’s also a past recipient of SFWA’s Damon Knight Memorial Grand Master Award (2006). Last year one of my favorite writers, Robert Crais, dedicated his latest Joe Pike mystery to him. Harlan says over 200 books have been dedicated to him in his lifetime. He’s been blessed with a revitalization of his writing after being diagnosed and treated for Clinical Depression – ending a stretch of time when he believed he was simply dying and had announced his last convention appearance. Last year Harlanbooks.com produced four Ellison projects. Brain Movies: The Original Teleplays of Harlan Ellison, Volumes One and Two collect his television scripts, which appear exactly as they did when he pulled them from his Olympia manual typewriter, before any alterations by the shows’ producers. A limited edition of Volume One with special material, signed by Ellison and J. Michael Straczynski (author of the introduction), made over $70K he says. The second volume of Brain Movies features an introduction by Patton Oswalt and six more Ellison teleplays. Among them are “Mealtime,” an episode of Voyage to the Bottom of the Sea that resulted in an ABC censor having his pelvis broken by a model of the Seaview (and was aired under the Cordwainer Bird pseudonym); plus two episodes of The Man From U.N.C.L.E. Harlan 101: The Sound of A Scythe and 3 Brilliant Novellas is notable for the reappearance of Ellison’s second novel (The Sound of A Scythe) in a substantially revised and expanded form and using the author’s preferred title (the original publisher renamed it The Man With Nine Lives without Ellison’s consent). It’s 25% longer than in the 1960 edition, which Ace chopped by 40,000 words. In one week in December he had 5 books come out. One of them, Bugf#ck: The Worthless Wit & Wisdom of Harlan Ellison, has already sold through two printings – something like 70,000 copies. The small-sized hardback book (128 numbered pages with a 4 x 5.5 inch trim size) gathers Harlan’s best bon mots. There is more on the way in 2012. Harlan has a story in the forthcoming Shadow Show: All-New Stories in Celebration of Ray Bradbury edited by Sam Weller & Mort Castle. There will be a numbered edition limited to 500 signed by all the contributors except Bradbury, priced at $75, and a lettered edition limited to 26 copies, which is signed by Bradbury, going for $500. For more information and to order, click this link. Among the other contributors are Margaret Atwood, David Eggers, Neil Gaiman, Alice Hoffman, and Joe Hill. In 2012 Kicks Books of Brooklyn will reissue the gang stories he wrote as Paul Merchant in the late 1950s. Without a doubt, Harlan’s already hard at work securing a spot at the front of the field of this year’s newsmakers. This entry was posted in Like Show Business and tagged Harlan Ellison, J. Michael Straczynski, Neil Gaiman, Ray Bradbury by Mike Glyer. Bookmark the permalink.